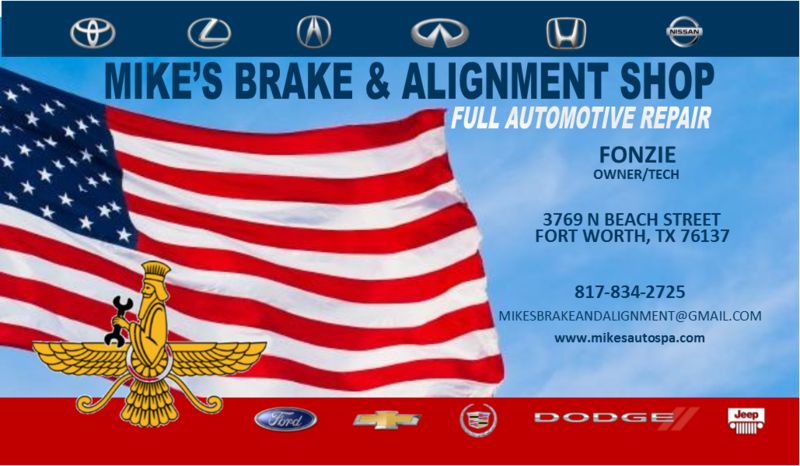 Opened in 2004, Mike's Brake & Alignment Shop is completely family owned and operated Auto Repair Shop. Our Shop and office is ran by Fonzie and Lila. Fonzie, owner and techinician, has many years of experience servicing and repairing all makes and models of vehicles. We take a great deal of pride in our work and in our customers. While the services we provide are exceptional, it is our honest work and a lifelong love for cars that keeps us going. We don't treat customers as one-off folks that we'll never see again. We look at our business differently than a lot of automotive shops. Our goal is to build a lasting relationship with customers who trust in our work. Essentially, we want to make sure customers are happy with our work and safe on the road. And by all accounts, it appears we are doing an excellent job. Customers continually tell us they heard about our shop from a friend that highly recommended us. For over 10 years, we have survived on recommendations which only goes to show our obsession with providing the upmost trustworthy and reliable repairs in the Fort Worth area. Stop by the shop to speak with us about your vehicle. We will be happy to have a look at the problem you are experiencing or the service/maintenance you may need. We will provide you with the best price we can offer for our services. we reserve that for the air in your tires.